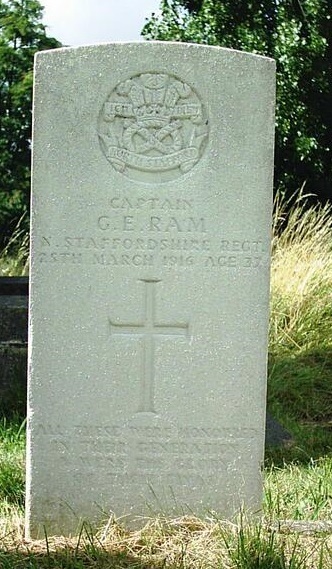 George Ram was born into a family of clergyman and joined the North Staffordshire Regiment in 1901, aged 22, seeing service in South Africa before becoming aide de camp to the governor of Newfoundland. He died from the effects of “trench fever” incurred on the Western Front in 1916. George Edward Ram was born at the vicarage at Teddington, Middlesex on 25 April 1879, the eldest child of the Revd. Robert Digby Ram (1844–1925) and his wife, Mary Anne née Anson (1849–1889). Robert Digby Ram was the son of the Revd. Abel John Ram, canon of Rochester Cathedral, and Jane, the daughter of James Stopford, 3rd Earl of Courtown. He was vicar of Teddington from 1878 to 1882, and then at St Mary’s, Hampton from 1882 to 1911. Between 1896 and 1919, he was Prebendary of St Paul’s Cathedral. In September 1877, he married Mary, the only daughter of George Edward Anson (1812–1849), CB, Keeper of the Privy Purse to H.M. Queen Victoria, and a cousin to Lord Lichfield. Robert and Mary had three children: George Edward, born 25 April 1879, Emily Jane, born 14 April 1882, and Frederick Montagu, born 30 August 1885. George was baptised at St Mary’s Church, Teddington on 21 May 1879, by his grandfather, Canon Abel John Ram. On 9 October 1907, at St Stephen’s Church, Cheltenham, George married Millicent Grace Webb, the daughter of the late Commander Augustus Henry Webb, RN (1834–1886). The service was conducted by a cousin of the groom, the Rt. Rev. Adelbert Anson (1840–1909), formerly Bishop of Qu’Appelle in Saskatchewan, Canada and now a Canon of Lichfield Cathedral. The bride was given away by her brother, Dr. John Curtis Webb. George and Millicent lived at 16 Ventnor Villas, Hove and had two children: Georgiana Mary (born at Hove on 31 July 1908) and George Digby Walter (born at Kensington on 17 March 1916, eight days before his father’s death). George failed to complete his degree course, and by 1902 was a full-time soldier. George was initiated into Sackville Lodge No 1619 at East Grinstead on 6 January 1914, alongside Arthur Midmer, a builder. Both men were passed to the second degree on 3 February and raised to the degree of a master mason on 3 March 1914. On 11 August 1915, George Ram was a joining member of Doyle’s Lodge of Fellowship, No 84 in Guernsey. On 3 September 1901, George enlisted as a second lieutenant in the 4th Battalion, the Prince of Wales (North Staffordshire Regiment). From 1901 to 1902, he served in South Africa with his battalion during the Second Boer War, seeing service in the Cape Colony and later the Bechuanaland Protectorate. His service in South Africa earned him the Queen’s medal with three clasps. After the Boer War ended in 1902, the battalion returned to barracks in England. On 7 February 1903, George received his first promotion, to lieutenant. On 11 February 1904, George was seconded as aide-de-camp to Sir Charles Cavendish Boyle, KCMG, the Governor and Commander-in-Chief of Newfoundland. Sir Charles Cavendish Boyle (1849–1916) had been appointed Governor of Newfoundland in March 1901, but shortly after George’s appointment as his ADC, he left the island and in August 1904 was appointed Governor of Mauritius, with George accompanying him to his new post. George received his final promotion to captain on 29 November 1905. Following Boyle’s retirement in April 1911, George rejoined the 4th Battalion of the North Staffords, now placed in reserve. Until the outbreak of war in 1914, George found employment as a private tutor, latterly living at The Drive, Hove. When war was declared in August 1914, the 4th Battalion was mobilised and sent to Guernsey to take over the garrison there, where they were to remain until October 1916. On 22 December 1915, George, now attached to the 2nd Battalion South Staffordshire Regiment, was sent to the Western Front. George spent only three months at the front line, during a relatively quiet period of the war. Monday March 13th I felt very seedy all day and went to bed as soon as I got into billets. Tuesday March 14th I stayed in bed all day. Doctor said I had temperature of 102°, so I came down to 1st Dressing Station and was motored to Bethune No 1 Casualty Clearing Station. My temperature was 103° by then. Wednesday March 15th Had a poor night, awful cough & throat. Coughed all day. No better by evening. Temp 102°. Thursday 16th Went on hospital train for Havre base. Took 26 hours. Very tiring. Friday 17th Arrived Havre 11 am. Here examined at station and detained at No. 2 General Hospital for 6 hours. Here the diary ends, but George was then sent to England, via Southampton, to Lady Inchcape’s Hospital for Officers at 7 Seamore Place, Mayfair, London W1. On arrival at the hospital, on 20 March, he was “very sick” and was diagnosed as suffering from Lobar Pneumonia. He failed to recover, and died on Friday 25 March 1916. A.F. Marcom, the doctor responsible for treating George, reported that his illness commenced with “trench fever” combined with a heavy cold, “apparently due to exposure whilst on duty”. His transfer from the front line to hospital had taken over a week and involved ten separate stages. In his report, Dr. Marcom added “He remained on duty until the last possible moment and was extremely ill with Pneumonia – Bronchitis on arrival here”. As well as on the Masonic Roll of Honour, George Edward Ram is commemorated on the Hove Library World War 1 War Memorial. 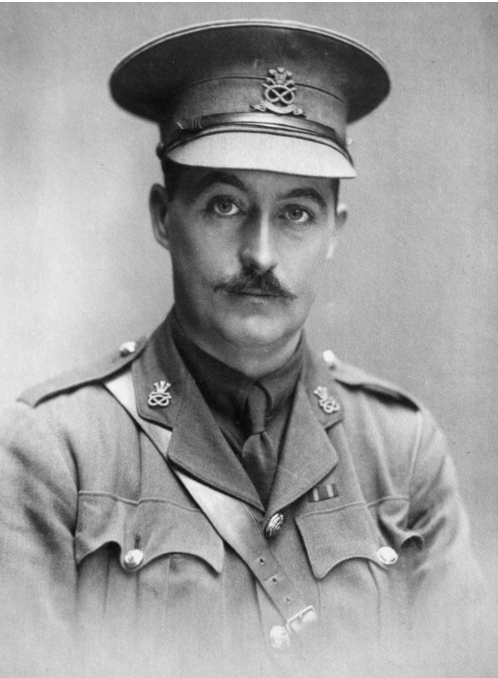 He was awarded the 1914–15 Star, the British War Medal and the Victory Medal. George’s widow, Millicent, died at Crowborough, Sussex on 29 January 1943. Their daughter, Georgiana, married Geoffrey Herbert in 1930 and died in 1964, leaving a son, also Geoffrey, born in 1939. George’s son, George Digby Walter Ram (born a week before his father’s death) served in the Royal Navy, reaching the rank of Lieutenant. He married Penelope Cruden in 1941; they had at least one son, born in Egypt in 1951. George’s brother, Frederick, served in the First World War as a private in the 8th Battalion, the Border Regiment. His brother in law, Edmund Melville Webb, was a lieutenant in the 4th Battalion of the North Staffordshire Regiment and died of wounds at Boulogne on 1 May 1915. John Curtis Webb also served in the war, as a major in the RAMC; he was mentioned in despatches and awarded the Order of St John of Jerusalem and the Order of Cruz Vermelha of Portugal.